"smallest grounds in IPL 2019, 9 runs an over is the average score on this pitch this season. A good chasing ground, Pitch will favour pacers over spinners and a good total can be expected." Matthew Kelly has been signed as replacement for injured Anrich Nortje. Andre Russell is also suffering from injury issues and can be slightly risky. However, His playing chances are high. Sunil Narine did not play last match due to slight hamstring injury and can come back in the playing11 replacing Joe Denly. Chris Lynn also missed out due to flu and can return in place of C Brathwaite. Among Harry Gurney and Lockie Ferguson anyone can play. Chances of H Gurney are more. Harbhajan Singh out of KKR game due to neck injury and family issue. Dwayne Bravo is ruled out for two weeks due to hamstring injury. Lungi Ngidi and David Willey are also ruled out of IPL’19. for more must watch Upcoming Video Team. Invest Less because this match is very risky due to credits issues and Players form. If you can't edit team after toss, stay away from this match. Shubham Gill can come in high batting order again. his averages 67.50 at a strike-rate of 150 in the IPL if he bat within top 4 order. for more Must watch Video. Toss: CSK Won the toss & opt to bowl first. 1 Faf du Plessis, 2 Shane Watson, 3 Suresh Raina, 4 Ambati Rayudu, 5 MS Dhoni, 6 Kedar Jadhav, 7 Ravindra Jadeja, 8 Mitchell Santner, 9 Imran Tahir, 10 Shardul Thakur, 11 Deepak Chahar. 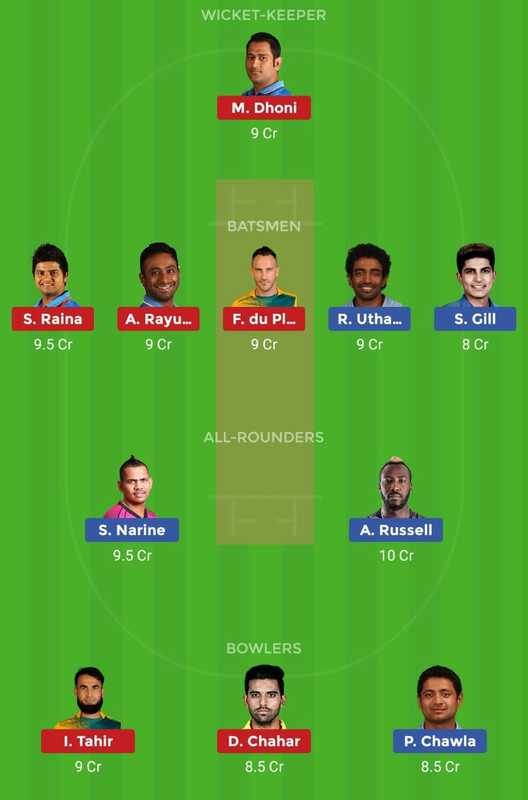 Drop P Chawala Pick P Krishna & C Lynn. Dinesh Karthik(C), Chris Lynn, Sunil Narine, Robin Uthappa, Shubman Gill, Andre Russell, Nitish Rana, Carlos Brathwaite, Kuldeep Yadav, Prasidh Krishna, Prithvi Raj, Piyush Chawla, Sandeep Warrier, Shrikant Mundhe, Harry Gurney, KC Cariappa, Joe Denly, Lockie Ferguson, Rinku Singh, Nikhil Naik.